Maintaining your equipment and processes prevents costly downtime and productivity losses. 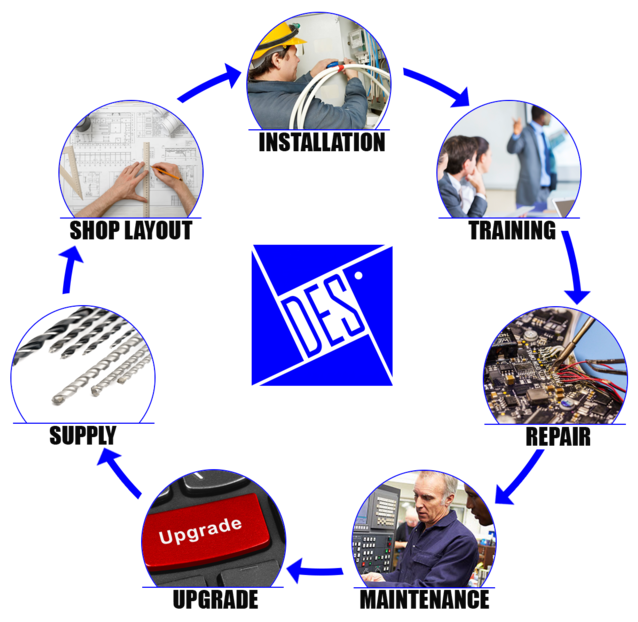 DES offers annual preventative maintenance and process evaluation plans for CNC Routers, CNC Granite/Marble saws, polishing/profiling line machines and more. What has changed since installation? Operator turnover or other additions to staff? Tooling and process advances in the industry? Concerned about regular maintenance not being done. If a process has evolved since you got your machine that increases productivity by 10%, what would that do for your business in a year? Are you no longer getting the expected results from the machine? For example, when you purchased the machine you were manufacturing 16 units per day. Now you are getting fewer units per day and are not sure what happened. The parts were holding down and producing clean cuts. Now months later there is some movement in the parts. Operators make changes to settings, or a new operator takes over the equipment and settings may need to be reevaluated during training. Our master technicians come out on a scheduled basis to perform a check-up for your equipment and process. During this visit we carefully inspect and test your machine, software, and tooling, and make adjustments and repair issues discovered. This service keeps your equipment and process operating at peak performance, extending the life of your equipment and avoiding downtime. You want to get the return on your investment you planned on, but sometimes the details of how to make that happen can get lost in the blur of everyday business. Perhaps you are not getting the anticipated production results from the machine. Maybe you are realizing the operator didn’t retain as much of the initial training as you’d hoped. Maybe tooling is going dull, or simply not working as expected. Our Equipment and Process Maintenance Plans are designed to give you a routine check-up, and ongoing expert assistance, so you’re not left alone. If you would like to discuss preventative maintenance for your equipment, submit the form below or give us a call today.